Laura Carlin: based in London, has achieved a great deal in a very short space of time. She gained a Masters from the RCA, at which she won the Quentin Blake Award and has gone to win the Uniqlo Fashion Illustration Award, resulting in her book Ten Days in Tokyo. She has published extensively with Walker Books, notably Ted Hughes’s Iron Man as well as The Folio Society. She is also in high demand for commercial work for leading brands both here and in the US. Laura has been voted by the Art Director’s Club of America as one of the 50 most influential creative’s under 30 years of age. The artwork in this show produced for A World of Your Own sees Laura both as an illustrator and an author for the first time. Eva Montanari: from Rimini in Italy, graduated from the State Institute of Art and the European Institute of Design in Milan but started out as a picture book author and illustrator whilst still studying. Widely regarded as one of the leading illustrators in Italy her work has been published and exhibited the world over, including several contributions to the Original Art Show of The Society of Illustrators in New York as well as at the Ragazzi International Exhibition at the Bologna Book Fair. 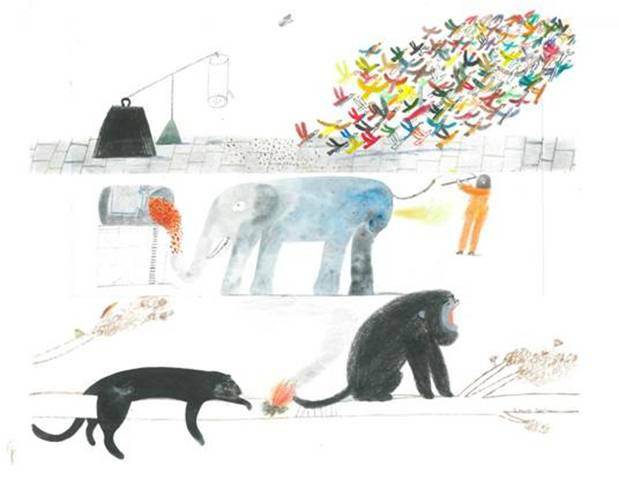 Her work for the recently published Italian classic Pinocchio is on show. Emily Sutton: graduated in 2008 with a BA in illustration from Edinburgh College of Art, having also studied at York College, and for a semester at the Rhode Island School of Design. Her work incorporates a love of pattern and design strongly influenced by the flora and fauna of the Yorkshire countryside, as well as a passion for folk art. Further inspiration is taken from 20th century illustrators such as Edward Bowden and Eric Pavilions, as well as the American lithographed children’s books of a similar era. Working within the commercial arena Emily is now venturing in to illustrated books for the first time this year with the forthcoming publication of The Christmas Eve Tree (Walker Books) later this year. Louise Yates: is both a writer and illustrator of pictures books. Having read English at Christ Church, Oxford she went on to study drawing at The Royal Drawing School, London. This has led on to her winning the Prince of Wales’s Award for Portrait Drawing at the Royal Society of Portrait Painter’s Annual Exhibition. She has published picture books since 2009 and has achieved notable success with Dog Loves Books both in the USA and the UK where it won the Road Dahl Funny Prize. This and subsequent books in this series have been nominated for The Kate Greenaway Medal and are currently being turned in to animation for television. Helen Ward: is already known to many as a leading illustrative talent, and has reached high acclaim on many occasions being short-listed for the Kate Greenaway Award for The Cockerel and The Fox, in 2003 as well as being twice runner-up for The National Art Library Award (Victoria and Albert Museum) in 1999 and 2001. She has worked extensively with Templar Books contributing to their best-selling Ology series over a number of years. I went to the private view for Kurt Jacksons new exhibition at the National Maritime Museum on Thursday. Line Caught and Local, his new collection was made largely in situ, whilst working alongside the inshore fisherman from the ports and harbours on the West coast of Cornwall. It is an amazing record of fishing today. I particularly loved the drawings he has made of the fisherman at work like ‘Two mackerel hand-liners having a chat at sea, June 2014’. A documentary of the inshore fisheries in Newlyn is a project I have been wanting to do for sometime. But I have always been puzzled how best to catch the real action at sea. I have tried drawing on boats before, and although I don’t easily get seasick I found concentrating on my drawing was enough to bring the sickness on. So I was particularly impressed that Kurt managed to get the amazing drawings he did working while under the cold wet, seasickness inducing conditions he must have been working in. When I asked him how he managed it he said that he found the sickness was worse on the one occasion his materials ended up in the fish hold and he couldn’t draw. The exhibition is open until January 25th and I would really recommend you go and see it if you can. I have been waiting for this Ted’s Talk by George Butler for a while . He speaks brilliantly about the personal and reflective quality that drawn reportage has over photographic reportage, and poignantly about his experience in Syria. Recently I was asked to speak at an illustration Forum about Reportage drawing, this is an essay I contributed to the book published to accompany the discussions. It is an account of some of the things I have learned during my practice and research. A few years ago I saw a retrospective exhibition of Robert Frank’s photographs. While there, I made notes in my sketchbook about how Frank’s photographs told stories as documentary. Included in the exhibition were several less familiar works such as his unsolicited photo essay Switzerland: The Motherland about the Landsgemeinde, (a form of democracy used in certain rural areas to elect authorities and decide community issues). Frank documented a potentially mundane story in the most poetic way. The meeting is a serious event with everyone from the community present. A normal documentary approach to this story would be to find an angle, either political or sensational, and show only this viewpoint. Frank chooses to document the crowd, the relationships between different generations, friends and family. By not taking an obvious journalistic angle on the story he reveals the heart of the community. Seeing these images made me question how obvious and literal a documentary narrative needs to be. I left the exhibition realising that I wanted to do in my drawings what Frank does in his photographs, to document but not in a literal way. My drawings needed to make the audience question what it sees. They should suggest a theme or feeling by the way that they are composed and edited. A title and perhaps an occasional comment should be all the writing that is necessary. I wanted to use the techniques Frank had used and which I had noted in my sketchbook to make my drawings more interesting and dynamic. He uses proximity and similarity to makes associations within a single image or between groups of images. He composes his pictures with large flat areas of tone that give the eye somewhere to rest, and he uses repetition and sequence to achieve cohesion, for example the repetition of the American flags throughout his photo book, The Americans. I tell you flatly, I am totally devoid of ideas when I have nothing to copy, but as soon as I see nature showing me shapes I find something worth saying – worth developing, even. There was always a disparity between the practices we were taught at art school, such as brainstorming for ideas that would answer a brief, and my ability to draw them. I hated working from photographic reference as it made my drawings stiff, inaccurate and poorly observed. And because I found it so difficult to draw the images in my mind I stopped trying. Instead I drew symbols to represent things. I no longer drew real people as I had done in my sketchbooks; I drew two dots and a smile. Soon I had a whole vocabulary of symbols that I could draw without reference and in time to meet a deadline. I had found a way to work to commercial briefs and did so. But the work I did had no connection to the thing I had an aptitude to do and which I loved. At best it was an unsatisfactory compromise. When I read John Berger’s thoughts on drawing, I understood why I found it so hard to complete the traditional illustration brief as I had been taught. My stimulation came from recording the world around me. I realised my strength lay in what Berger calls the first kind of drawing. I love to draw ‘the visible’. The process of making an observed drawing or study forces an examination of what is before my eyes ‘however ordinary and everyday this may be’, and this is the essence of reportage. It is an account of an observed or documented act or event. Subsequently, when I looked at the drawings of some well known artists who worked in reportage, I realised that they combined in their work all three forms of drawing that Berger describes and did not confine themselves to observational drawing on location alone. So I looked at documentary and street photography in preference to the work of reportage artists because here, it seemed to me, I would find examples of reportage that was made only whilst on location, and it was observational drawing on location that I wanted to pursue. Initially my research centred on photo-journalism from the Second World War. At the time magazines like Picture Post used both photographs and drawings to illustrate their stories. This allowed me to analyse the different ways in which drawings and photographs functioned in telling a common narrative. From Roland Barthes I learnt that a photograph, unlike a drawing, is denoted; without a connoted message it cannot tell a story. A press photograph is different. Its treatment – the layout, text, titles and captions – give it a connoted message. A photograph depends upon the writing that accompanies it and the contexts in which it is seen to tell a story. In a drawing, however, the artist’s mark-making and interpretation convey a narrative in addition to any narrative derived from the captions and titles that accompany it. I concluded that I wanted somehow to combine drawing’s intrinsic ability to tell a story with a photograph’s ability to capture a moment. The photographer Henri Cartier-Bresson refers to ‘the decisive moment’’, the instant during an event that captures its very essence. Often when I was drawing, a story would reveal itself. This was the ‘decisive moment’ that I had seen in photographs and that I wanted to capture in my drawings. I realise now how impossible a task I had set myself. I am not a camera. I cannot freeze time like a photograph, capture all the details of a story in a fraction of a second. But at the time I failed to understand what I was trying to do. I did not realise how profound was the influence photography had had on how I saw the world. While I drew on location, I absorbed what was happening around me. Through drawing I was trying to document what I saw and to give some impression of what I heard, smelt or observed. When things happened, I wanted to blink and freeze a memory, recording not just the visual appearance of the moment but all the other details that make up human experience and our memory of it. I wanted to show my memories to others as drawings. What served in place of the photograph; before the camera’s invention? The expected answer is the engraving, the drawing, the painting. The more revealing answer might be: memory. What photographs do out there in space was previously done within reflection. I have grown up with photographs in newspapers and magazines and with news stories on television. I cannot imagine a time before there was a ‘photographic way of seeing’. I have experienced the world through photographs taken by other people. Images that show me the view from Mount Everest or the war in Iraq, places I have never been to and situations I will never see. I wonder how much of what I know of the world is a result of my own experiences and how much is a result of seeing photographs of someone else’s experience. Of my childhood memories how many did I really remember and how many were from the photographs others took and the stories they told me about them. Our memories seem pale versions of the ones reflected in the photographic image. Photographs do not simply render reality-realistically. It is reality which is scrutinized, and evaluated, for its fidelity to photographs… Instead of just recording reality, photographs have become the norm for the way things appear to us, thereby changing the very idea of reality, and of realism. Sontag describes how our lives are so saturated with photographic images that we rarely question how the ‘photographic way of seeing’ shapes how we perceive the world; how it shapes our memories and, as artists, how it shapes our visual language. The stories that I have wanted to communicate have been conceived within a ‘photographic way of seeing’. I have tried to tell them as a photograph would, attempting to draw fast enough to capture the decisive moment. I have copied reality meticulously, hoping that the more accurate my drawings and the more similar to photographs they were, the more effectively they would tell a story. I hoped that accuracy would imbue my drawings with the qualities of truth and objectivity that we associate with a photograph. Now, having rejected these aims, I can see the intrinsic value of a drawn reportage account of an event. The photographed world stands in the same, essentially inaccurate relation to the real world as stills do to movies. Life is not about significant details, illuminated a flash, fixed forever. Photographs are. The series of drawings, From The Loft Floor is an example of my recent practice which, I think, illustrates the points I wish to make. It documents the building of a 42 foot wooden sailing boat by Working Sail in a boatyard in Cornwall. The boat took 20 months to complete, from the plans being transferred onto the loft floor to the launch. Through each step of the construction, I sat in a corner drawing on large pieces of paper pinned to a drawing board, while trying not to get in anyone’s way. I was attempting to record some of the technical aspects of traditional boat building, but I was also fascinated by the story of the people in that place at that time, skilled shipwrights and experienced sailors, people who were passionate about what they did. Each drawing, from this series of fifty, took me eight hours or more to complete. During that time I was absorbed in the location, aware of the cold and the damp, the activities of the shipwrights working around me and aware also of the aspect of the boat’s construction I was trying to record. I could not record every piece of wood shaped, every fastening fixed or every technical detail of the build. Nevertheless, my attention was intensely focused on observing and recording what was going on. I restricted my location to the interior of the boat shed to give contextual cohesion to the series of drawings. This forced me to look hard and to consider carefully what I should include in a drawing, and where the focus should fall. Every time I drew I noticed something different, either in the fixed elements of corrugated sheds and scaffold poles or in the changing elements of people, tools and the progression of the build. The shipwrights were used to my presence and carried on as if I was not there, speculating on each other’s love lives, squabbling over which radio station to listen to or arguing over the merits of a lugger versus gaff rig. Effectively, I was ignored. Drawing an event is an unthreatening activity. It is as passive a way of recording as possible. I believe that my presence changed the behaviour of those around me very little, unlike the usual reaction to being documented by a camera or a microphone. My drawings would change as the world around me changed. My carefully planned composition would have to adjust as the scaffold poles I was drawing were knocked away or clamps were removed. A Jack Russell owned by one of the shipwrights would run around settling in front of what I was attempting to draw and would get included in my drawing. The narrative I was telling would develop as the narrative in front of me developed. The process of drawing my environment forced me to be hyper-aware of everything that happened around me; not just what I saw, but what I heard, smelt and touched. I was aware of the sound of angle grinders and shouting, the smell of boiling pitch and sawdust and coffee, the feel of the wooden plank I was sitting on and the mud beneath my feet. Every colour chosen, every mark made in every drawing was a result of multiple different decisions made one after another during a sustained period of concentration. All of these decisions were a reaction to my environment during a specific time frame. This reflected my experience of time and my experience of the place. So, paradoxically, I would argue that a drawn record is a more accurate record of an event than the dominant form of reportage, photography. The photograph may be a minutely accurate record of an instant but it is less in accord with our experience of an event. A drawing more accurately shows the way we experience time and the fragmented way we remember. Berger, J (1980) About Looking, London, Writers and Readers Publishing Cooperative. Greenough, S (2009) Looking In Robert Franks The Americans, Washington, National Gallery of Art. Knipe, T (1983) Drawing in the Air: An Exhibition of Sculptor’s Drawings 1882-1982, Sunderland, Ceolfrith Press No. 70. Sontag, S (1973) On Photography, New York, Farrar Straus and Giroux.